Built in 1890 by Irwin S. DeFord, self-described "money-lender" and capitalist. 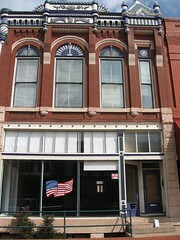 The DeFord Building is perhaps the gem of Joseph Foucart's architecture in Downtown Guthrie. The sidewall, facing "Government Acre" surrounding the Land Office, an area more distinguished than its front, Featuring contrasting-colored arched windows with worked wooden fans above corbelled brick, with a small turret marking the south end. Detailed acanthus leaves decorate capitals of defining pillars. DeFord lived upstairs in the building when completed, and the New York Clothiers (Cohen and Strauss) were on the first floor. By 1892, however, the U. S. Post Office temporarily replaced the clothing store. Offices for lawyers were located on the 2nd floor. The U. S. Courtroom was located in the basement until the Federal Building (Post Office and Courtroom) was completed in 1903. Flora M. Wills purchased the building in 1904. She and her first husband Joseph Wills, operated their general store there. Later, the store was used exclusively for furniture, and they added the Willis Building immediately south in 1914. After Willis died, his widow operated the store alone until she married B. W. Kightlinger in 1923, and he joined her in the business. She died in 1955 and Mr. Kightliner continued operation of the store through 1981. 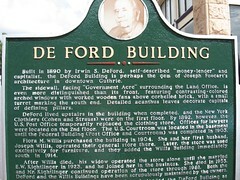 Both the Deford and the Willis Buildings have been scrupulously maintained by the owners. Mr. Kightlinger (whose picture is shown) deeded the DeFord Building as a gift to the Logan County Historical Society on December 7, 1981.